In excess of 50% of all traffic enters the village at speeds above the 30 mph limit. Great Addington sits on unclassified roads at the intersection of two cross country routes. The speed of traffic through the village has been an issue for several years and the Parish Council has been regularly asked at Annual Parish Meetings to consider traffic calming measures. In all discussions with District and County Councils it has been made clear that support data would be required to justify any expenditure by District or County. In June 2011 Great Addington Parish Council purchased a portable Sierzega GR32c Vehicle Activated Sign (VAS). This radar device registers speeds of vehicles travelling in both directions. Each reading is logged with the date and time. For traffic travelling towards the VAS the instantaneous speed is displayed on a screen whilst the vehicle is within range of the detector. The speed when first detected and the speed at the VAS are recorded. For traffic travelling away from the detector the speed at the VAS is recorded. The range of detection is typically 50 to 200 metres and varies with the line of sight at the location and the size of the vehicle. Possible interference from trees, pedestrians, from vehicles travelling in opposite directions at the same time, or a slow moving traffic queue the data from this device cannot be regarded as an absolute traffic census. The unit has now been in operation for discreet periods throughout the past six months. A review of the data from all four locations follows. No. of Days = days unit in operation. At other times low batteries prevented data collection. Count = total number of vehicles recorded. Dmax = highest vehicles/hour each day averaged over whole period. Davg = total vehicles/total hours. Vavg = average of all first detected speeds (mph). Vmax = highest single speed in period (mph). V85 = 85% of vehicles first detected at this speed or lower (mph). Vred = speed reduction whilst within detection range (mph). No. of Days = days unit in operation. At other times low batteries prevented data collection. Count = total number of vehicles recorded. Dmax = highest vehicles/hour each day averaged over whole period. Davg = total vehicles/total hours. Vavg = average of all first detected speeds (mph). Vmax = highest single speed in period (mph). V85 = 85% of vehicles first detected at this speed or lower (mph). 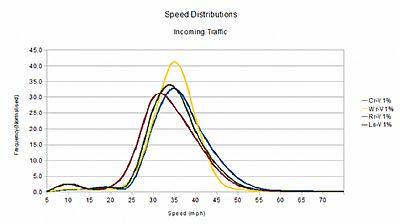 The tabulated data above, together with the illustration of “Speed Distribution” below suggests the pattern of incoming speeds on all four roads is broadly similar. 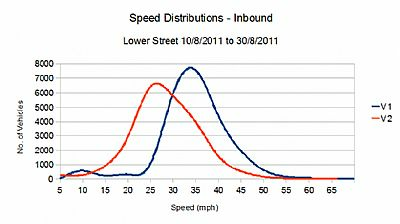 (The distribution for Woodford Road indicates a slightly narrower variation in speeds.) It is therefore proposed that if there is a speed problem on one of the village entrance routes, there is a problem on all four. Between 50% and 75% of all traffic entering Great Addington is exceeding the 30mph limit. Approximately 15% of all incoming traffic exceeds 40mph. Examination of the data from Lower Street (as an example) illustrates the significant reduction in speed between first detection [up to 200 metres distant] and the vehicle passing the VAS. Eighty five percent of traffic slows from 40 mph to 34 mph. There is some evidence that faster vehicles cut their speed by a greater amount. It may be that the speed reduction is a result of the initial speed being flashed by the VAS, conversely the driver may have been slowing as he entered the 30 mph limit. It would be interesting to conduct a specific trial in which for random periods the VAS recorded data but did not flash. Traffic density, measured as the total vehicle movements during the period the VAS was in operation at each site, varies between 30 and 50 vehicles per hour in each direction. The VAS records data for each hour of each day and averages the traffic movements for each of these one hour intervals. The peak one hour average for all routes is between 100 and 145 vehicles per hour in a single direction. There is a general trend for a “rush hour” peak in both the morning and the evening. 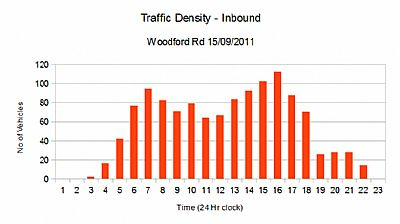 The chart below shows data for one specific day (Thu 15th Sept. 2011) on Woodford Road. Whilst the speeds recorded in Woodford Road may not be as high as elsewhere, it should be noted from the traffic densities that at peak times a vehicle in one direction or another passes Great Addington Primary School every 20 seconds. The peaks coincide with start and end of the school day. On other routes the peaks are not so symmetrical. There appears to be correlation between high peak densities inbound on Ringstead Road in the mornings and outbound peaks on Cranford Road, with the reverse traffic flow in the evenings. Traffic volumes increase throughout the week from a low on Sunday/Monday to a high point on Fridays when the volume can be double that earlier in the week.